Model information: Breyer Stablemate scale G1 Arabian Stallion mold; 12-piece Stablemates set, 1997 JCPenney special run. Lines to Dreamfinder, Seattle Slew[TB]. 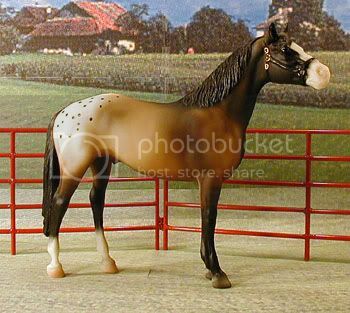 Model information: Breyer "Man O War" mold; "Gatsby," Breyer Tour special run in 2000. Sire is live show placed, dam comes from photo show placed parents. Lines to Storm Cat[TB]; double bred Palace Music[TB]. 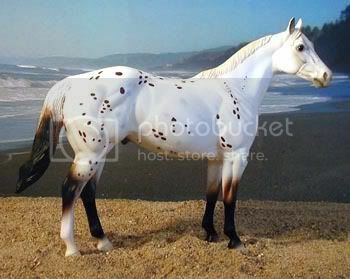 Model information: Stone Horses Thoroughbred mold; customized/painted by Yvonne Davey. 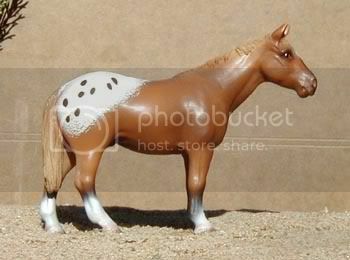 Model information: Breyer Classic scale "Silky Sullivan" mold, #265 "Spice", produced 1995-1996. Lines to Storm Cat[TB], Acclaim. Sire has been live show placed. Model information: Breyer "Cigar" mold, "Nodin", special run for Mid-States Distributing in 2004. Lines to Storm Cat[TB]; Sire is a photo show champion and dam is half-sister to Cigar[TB]. 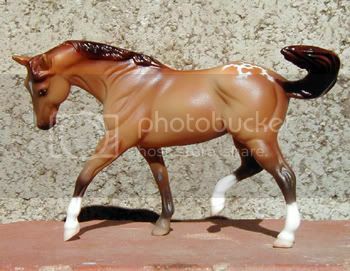 Model information: Breyer "Cigar" mold, #90135 "Wanderlust", Connoisseur special run sold through Breyer's magazine, Just About Horses; 350 made in 2005. Lines to Bold Ruler[TB], War Admiral. 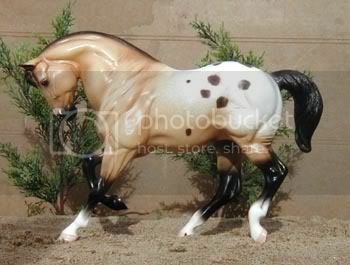 Model information: Breyer Traditional scale resin "Silver Lining" mold, custom painted by unknown artist. Dam is photo and live show placed. Lines to Time Flies, Dreamfinder, Lookout Majestic[QH], High Sign Nugget. Awards: Photo show placed, live show Reserve Champion. 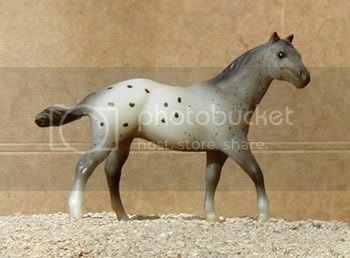 Model information: Black Horse Ranch resin Hunter mold, discontinued. 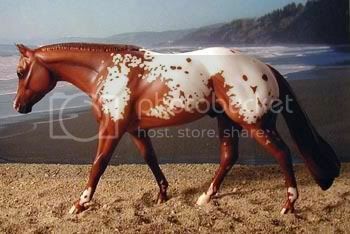 Sire comes from winning model-bred lines and is himself a live show Halter Reserve Grand Champion and Performance Champion and a multiple winner, multi-Champion/Reserve Champion in IPABRA; and 2008 IPABRA Top Ten OF Appaloosa. Dam was a Top Ten at NAN and has several other live and photo show wins, including broodmare classes with IPABRA. Awards: Top Ten at NAN; has achieved Champion status with IMEHA. 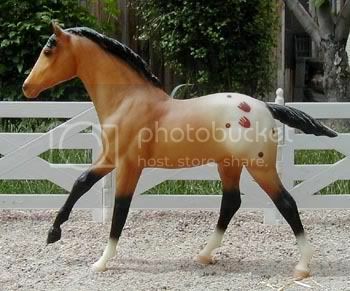 Model information: Breyer Standing Stock Horse Foal mold; "Night Deck" and "Night Vision" set, special run for Black Horse Ranch in 1992, 1,500 sets made. Lines to Dreamfinder, Dash For Cash[QH]. Awards: Has achieved Champion status with IMEHA. Model information: Breyer "Zippo Pine Bar" mold; #1166 "Impress Me Shannon," Limited Edition produced 2005. 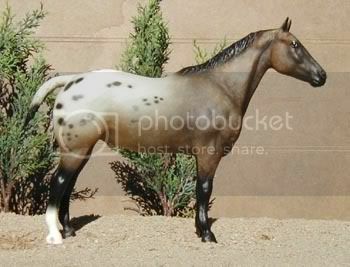 Lines to Klassy Par Bar[QH], Zan Paar Bar[QH], Sire is a multi World Champion reining horse. 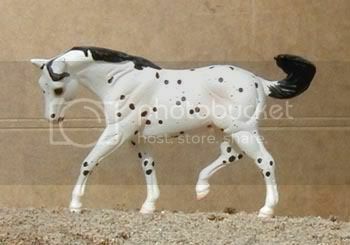 Model information: Breyer Stablemate scale G2 Stock Horse mold; Stablemates Country Stable Set, special run for K-Mart stores in 2006. Sire has multiple halter championships and dam has multiple championships in halter and western performance and is NAN qualified. 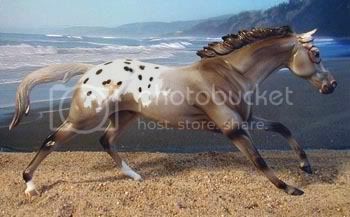 Model information: Stone Horses Performance Horse mold; "Pleasant Dreams," regular run. Lines to Princes Jim, Prince Plaudit, Mighty Bright. 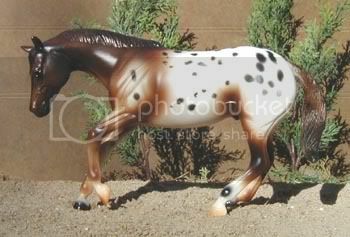 Model information: Breyer Action Stock Horse Foal mold; #1169 Appaloosa Foal, Leopard, produced 2002-2004. Lines to Dreamfinder, Goer, Prince Plaudit. 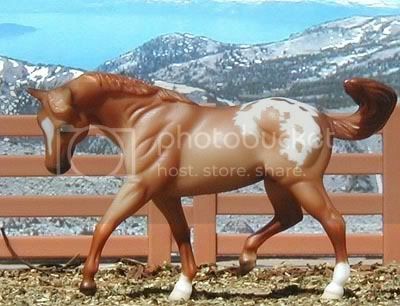 Sire is a multi-champion, grand champion, and a Superior Event (halter) horse with IMEHA. Dam is a multi-champion. 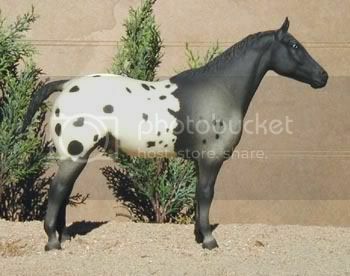 Model information: Stone Horses Performance Horse mold; portrait of John Lyon's "Bright Zip," second regular version, produced 1998-2001. Lines to Live The Dream, Goer. 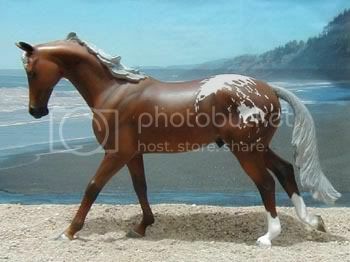 Model information: Stone Horses Ideal Stock Horse mold; "Leo's Royal Flush, special run for the 2005 Life's A Beach live show; 1 of 50 glossy models. Lines to Zan Parr Jack[QH], Doc's Hickory[QH], Hollywood Taps GN. Awards: NAN qualified; photo show placed, has achieved Superior Champion status with IMEHA. Lines to Good Twist[TB], The Executive. 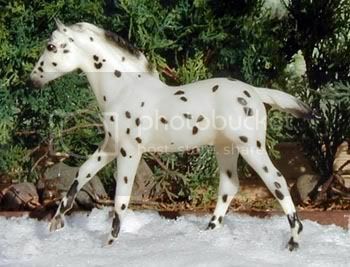 Model information: Breyer Stablemate G2 Stock Horse; JAH Special Edition Stablemates Gift Set, special run for Breyer's magazine, Just About Horses, in 1998. Lines to Bright Tribute, Goer. Dam is a reserve champion. 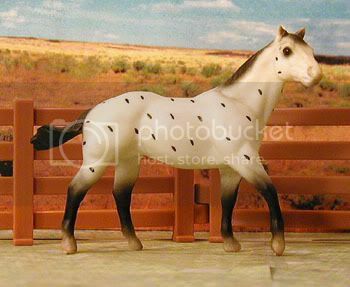 Model information: Breyer Stablemate G2 Stock Horse; #5601 Appaloosa, produced 1998-2002. Lines to Chief of Fourmile, Docs Benito Bar[QH]. Model information: Breyer Stablemate scale G2 Stock Horse mold, "The Mod Squad" keychain set, special run for the 2003 BreyerFest. Dam has placed in both live and photo shows. 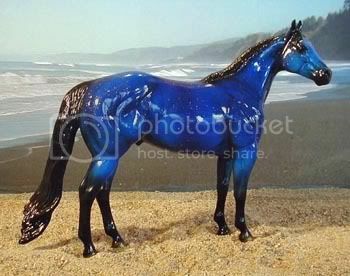 Model information: Stone Horses Ideal Stock Horse mold; Precious Stone series Lapis Lazuli. Lines to Cherry's Leader, Poco Tivio[QH], High Sign. 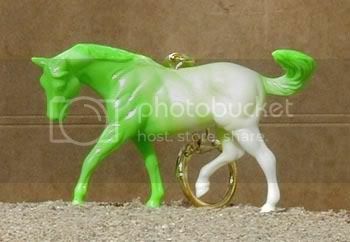 Model information: Stone Horses Performance Horse mold; John Lyon's "Bright Zip", first regular version, produced 1998-2001. Lines to Oughta Be Obvious. Sire is a multiple live-show winner and winning racehorse. Dam is photo show placed. 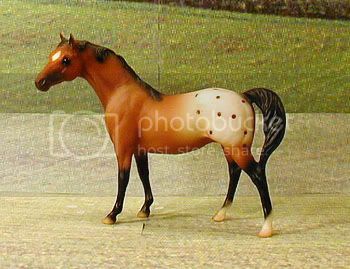 Model information: Breyer Standing Stock Horse Foal mold; Stock Horse Family,special run for the Sears Wishbook in 1983, star-face version. Lines to Hollywood Dunit[QH], Bar H Leo[QH], Cutter Bill[QH]. Sire was previously NAN qualified in Collectibility. 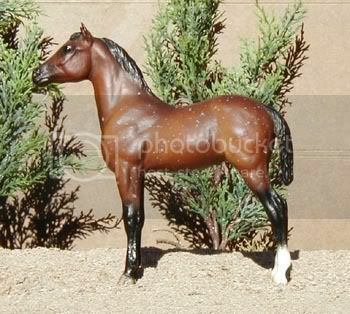 Model information: Hartland 11 inch Quarter Horse mold; special run of 100 pieces sold via eBay in 2001. Lines to Impressive[QH], Skip Bright, Princess Mirage, Feature[QH]. Sire is live and photo show placed, and was a grand champion, out of multiple grand champion parents. 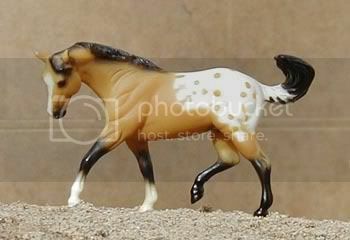 Model information: Stone Horses Ideal Stock Horse mold; "Shotgun Jetta" special run. Lines to Docs Benito Bar[QH], Alias King, Bendi Charge. Sire is NSBA and AQHA Hall of Fame inductee, and a leading sire of performance horses and money earners. 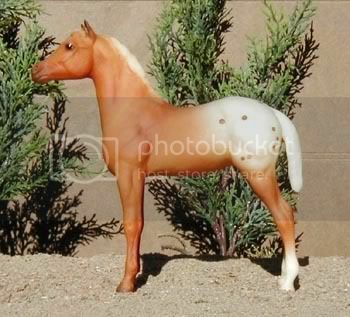 Model information: Breyer Stock Horse Stallion mold; Stock Horse Family set, special run for the 1983 Sears Wish Book. Lines to Dukes Diablo[QH], Checkmate Gold[QH]. 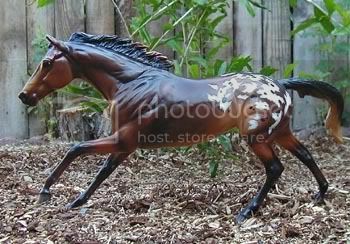 Model information: Breyer Action Stock Horse Foal mold; #725 Wakanda O'kie "Talks to the Gods", produced July-December 1998. Lines to Prince David, Mighty Bright. 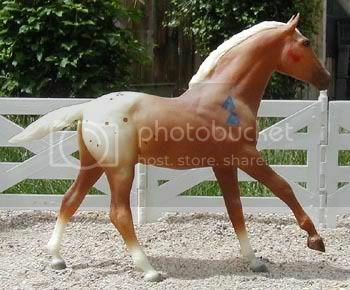 Model information: Breyer Action Stock Horse Foal mold; #724 Monka Tonga "Big Medicine", produced January-June 1998. Sire is an IPABRA Top Ten and son of the great Dell Mingo. Dam traces to a multiple Live and Photo show Champion/Res., as well as to a NAN Top Ten. Other lines include: Poco Dell, Mescal, Peppy San Badger. 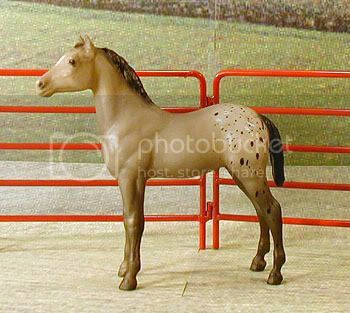 Model information: Breyer Standing Stock Horse Foal mold; #707598 "Cowboy Pride" set, special run for the 1998 JCPenney holiday catalog. Lines to Bold Print, Mr Impressive[QH]. 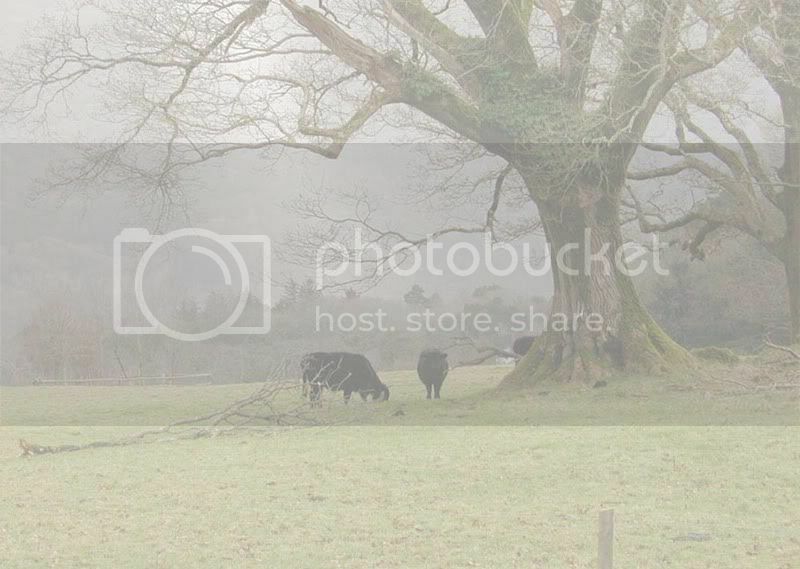 Sire is photo show placed. 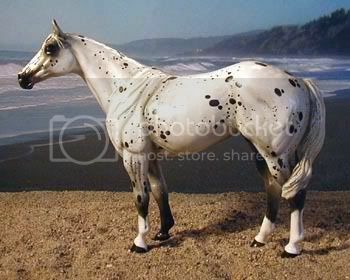 Model information: Breyer Stablemate G1 Quarter Horse Stallion; #59973 Appaloosa and Foal, produced 1997-1999. Sire has been NAN qualified, has multiple photo show placings and championships, has achieved Superior Champion status with IMEHA. Lines to Rustler Charger and a NAN Top Ten Quarter Horse. 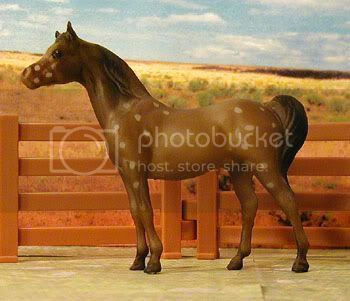 Model information: Breyer Stablemate scale G1 Quarter Horse Stallion mold; 12-Piece Stablemates Set, special run for the 1997 JCPenney holiday catalog. Sire is a multi-champion Reining horse, a leading sire of Reining horses, and a NRHA Hall of Fame inductee. 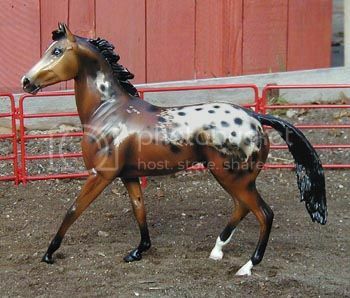 Model information: Hartland 11 inch Quarter Horse mold; one-of-a-kind test model for a limited special run done in 2001. Lines to Panic Power, Colonel Freckles[QH]. Dam is multi live show placed and NAN qualified. 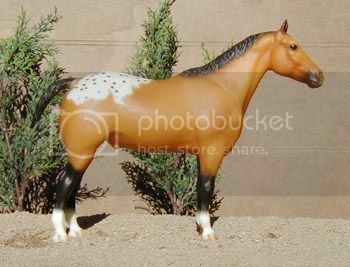 Model information: Breyer Ranch Horse mold; #750 "Hank" The Ranch Horse, produced 1999-2000. 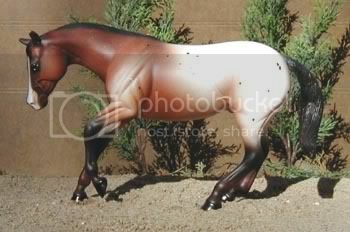 Sire is an ApHC Hall of Fame horse; lines to Prince Plaudit, Mighty Bright, Peppy San Badger[QH], and a NAN Top Ten model horse. 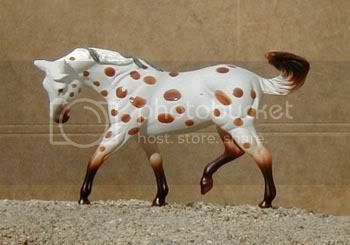 Model information: Schleich (Paddock Pal/Littlebit scale) Appaloosa; discontinued. Lines to Prince Plaudit, Doc Bar[QH], Rebel Rocket[QH]. Dam's sire is a multiple reserve photo show champ, and top ten with TOPSA. 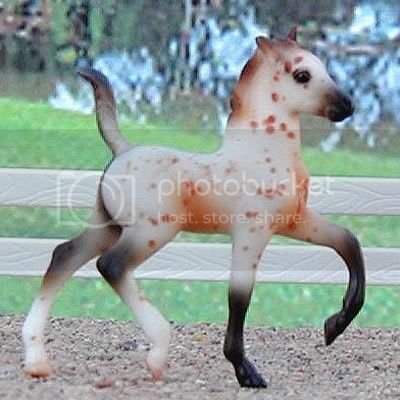 Model information: Breyer Standing Stock Horse Foal mold; Stock Horse Family,special run for the Sears Wishbook in 1983, solid-face version. Lines to Rustler Charger, Absarokee Sunset, Chief Of Fourmile, Money Creeks Rockledge, Siri's Snow Queen. Dam has been a multiple champion. Awards: Has been NAN qualified; has achieved Premier Champion status with IMEHA, including many division reserve and grand championships. 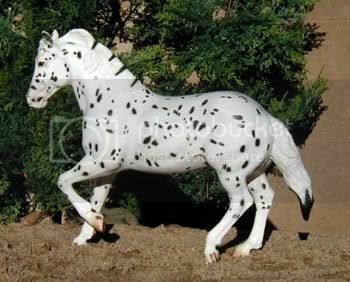 Model information: Cheval porcelain Appaloosa; limited edition of 2,500, produced in 2001. Lines to Bright Eyes Brother, Peppy San Badger[QH]. Awards: Top Ten at NAN; has achieved Superior Champion status with IMEHA. 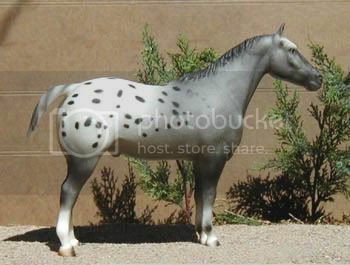 Model information: Breyer Performance Horse mold; #1140 Foundation Appaloosa, Produced 2001-2002. Lines to Three Chicks Snowcap, Chief Of Fourmile, Colonel Freckles[QH], Prince Plaudit. Sire is a photo show reserve champion. 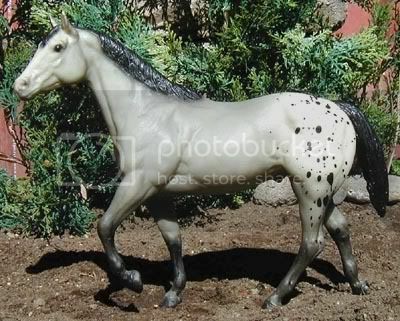 Model information: Breyer Performance Horse mold; #946 "Diamondot Buccaneer," Appaloosa, produced 1996-1997. Lines to Chief of Fourmile, Cutter Bill[QH]. 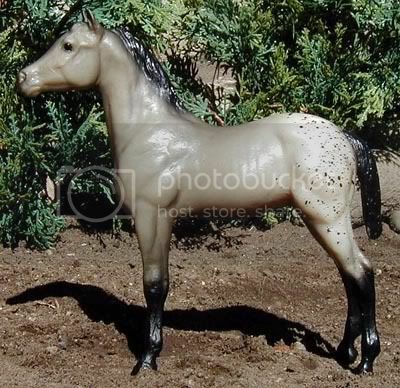 Model information: Breyer Stablemate scale G2 Stock Horse mold #5308 "Dude Ranch Play Set", produced 2001-2005. Lines to John Red[QH], Bright Eyes Brother, Star Mist. 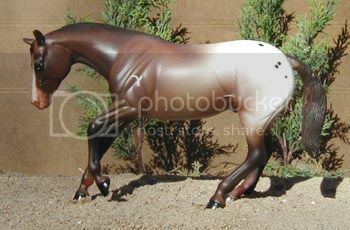 Model information: Breyer Performance Horse mold; #701600 "Marshall", special run for Mid-States Distributing in 2000. 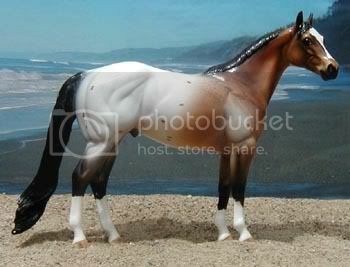 Sire is an ApHC Hall of Fame horse, a multiple National Champion, National and World Champion Race winner. Lines to Piccolo[TB], Whichone[TB]. 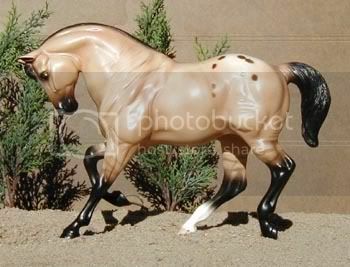 Model information: Breyer Performance Horse mold; #752 "Chief of Fourmile", 1999 Commemorative Edition; 10,000 made.